Lacking Votes, California Assembly Shelves Aid In Dying Bill : Shots - Health News Proponents of a bill that would let doctors give dying people lethal prescriptions ran into opposition from Latino Democrats. Backers say they're not through trying for approval. 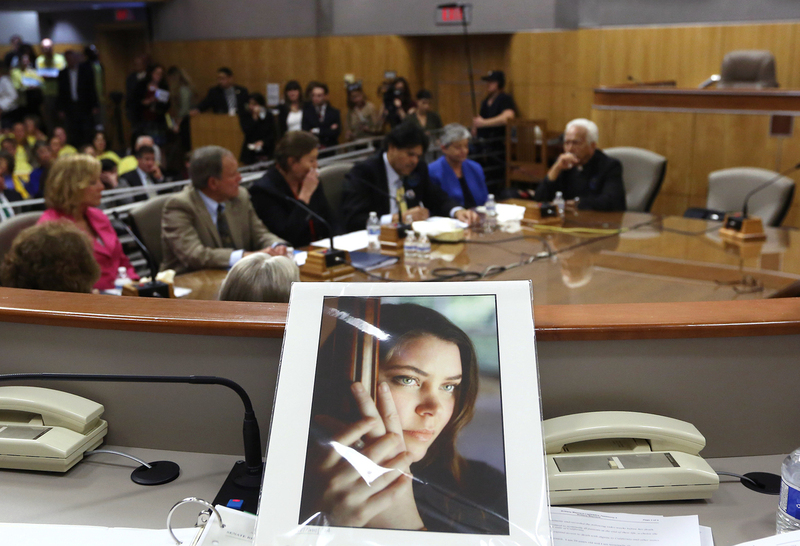 A photo of Brittany Maynard, who moved to Oregon to end her life as she was dying of brain cancer, sits on the dais of the California Senate's health committee in March. Recognizing they lacked votes in a key Assembly committee, authors of legislation that would have allowed terminally ill Californians to legally end their lives pulled the bill Tuesday morning. Senate Bill 128, the End of Life Option Act, had already cleared the state Senate, but faced opposition in the Assembly Health Committee. That included a group of southern California Democrats, almost all of whom are Latino, after the archbishop of Los Angeles increased its advocacy efforts in opposition to the bill. "We continue to work with Assembly members to ensure they are comfortable with the bill," said a joint statement from Sens. Lois Wolk, D-Davis, and Bill Monning, D-Monterey, and Assemblywoman Susan Eggman, D-Stockton. "For dying Californians like Jennifer Glass, who was scheduled to testify today, this issue is urgent. We remain committed to passing the End of Life Option Act for all Californians who want and need the option of medical aid in dying." Under the bill, mentally competent adults who are terminally ill with less than six months to live could request lethal medication from a physician. In an interview, Monning stressed that the bill is "not dead" and that it has two years — not one — for passage. "We're going to review our options," he said. "We invested a lot of energy in the Senate side, and we walk away from the decision today knowing that we're going to have to spend more time cultivating our colleagues in the Assembly." Last month, a poll found that 69 percent of Californians overall and 70 percent of Latinos supported the bill. The poll was conducted by the advocacy group Compassion and Choices. "The bill is still alive and well," Patricia Gonzalez-Portillo, a spokeswoman for the organization, said in an interview. "We will continue to work with Assembly members until they are comfortable with this bill." The bill had received a boost after the California Medical Association changed its stance from opposed to neutral. The bill is modeled after a 1994 Oregon law which permits aid in dying. Four other states — Washington, Montana, Vermont and New Mexico — have authorized it as well. In California, 29-year-old Brittany Maynard brought the issue to light after she moved to Oregon to utilize the state's death with dignity law. She was terminally ill with brain cancer and died last November. A posthumous video she had recorded was shown at a Senate hearing in March.